Toys has been and will always be part of us becoming a child and having a child. In one way or the other, toys became one of the reasons why we act and behave this way. One of the toys I had was a Batman figure, which is a freebie for a meal we purchased from a well-known fast food chain back then. It was around 3-4 inches tall and has movable arm and cape tied to its shoulders. I tell you, it was my favorite, and I bring it where I go. You may also have your own memorable story with toys. Toys will always part of our lives. Grown ups may not play with them anymore but I'm sure you still have it standing somewhere. Toys come in different form and caters to both genders, boys and girls. Toy manufacturers saw a huge potential to those young at hearts, that's why they keep on creating toys and collectibles that will last for generations. 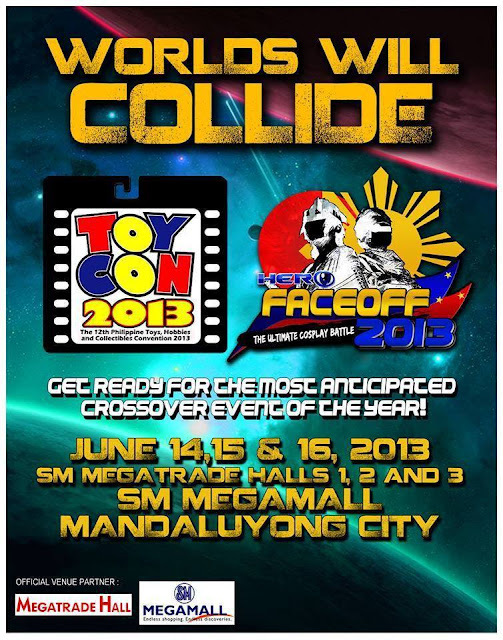 This June 14-16, 2013, the much awaited 12th Toycon will bring joy again to youngsters and young-at-hearts. This goes from June 14-16, 2013 at the SM Megatrade Halls 1-3 which will consume Function Rooms A-B. Toycon 2013 showcase the different toys and collectibles, from stuffed toys, to die-casts, to figurines, etc.